First, always moisturize (even for those of you with oily skin like me). The skin does interesting things when its too dry. It over produces oils and hence the oil confusion. So your “oily” skin is actually too dry. Sometimes the right moisturizer can fix everything. Use an oil free moisturizer on clean skin as a makeup base. I use the Neutrogena Oil-Free Sensitive Skin Moisturizer. You can find it in any drug store. You don’t have to spend a lot of money to get good products. For pimples, I always had success with a simple spot treatment like Differin gel. See your dermatologist for a prescription. Although as you know, most pimples just need to run their course until ready to be popped. For popping fun, I use this little guy to prevent scarring since this is a hands free and semi-sterile way of popping a pimple. 1. A good moisturizer. Neutrogena Oil Free Moisture – as a base on clean skin – see above. Use a quarter size amount and spread across face and neck. 2. 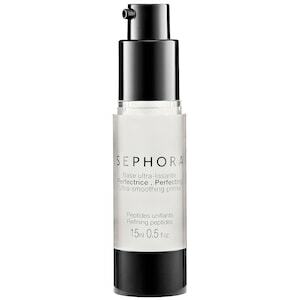 SO crucial, a primer – Sephora Perfecting Ultra-Smoothing Primer – I use a dime size and use it the same as I use the moisturizer, applying all over face/neck. It feels slightly oily but it holds makeup SO well. If you skip this step, you will find that makeup ends up sometimes wearing off earlier than you’d like. I think this is the most important item when setting a base. 3. A long wear wet foundation – Lorac Natural Performance Foundation – I use this in porcelain and I use this brush to apply. I start by using my fingers with a little bit of foundation on them to cover just my under eye circles and then use the brush to cover the rest of my redness/blemishes on my cheeks/forehead. I’m a fan of using a brush vs. sponge or contour sponge for foundation application because brushes really get into the skin better than any other product. It creates a flawless finish. 5. 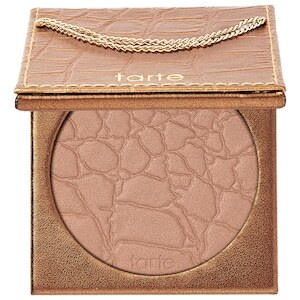 To add color to fair skin – Tarte Amazonian Clay Waterproof Bronzer – I’ve been using this bronzer for years. It makes such a great addition to my everyday routine because its not too harsh or dark and you really have control over how you want to look. Feeling more jersey shore than usual? keep applying.. want to just create a solid base look for everyday like I do? lightly brush this all over your face. I don’t use a bronzer brush because I find it can be too harsh and make lines which is a no-no. I use this one to apply all over lightly. 6. To contour and look alive! 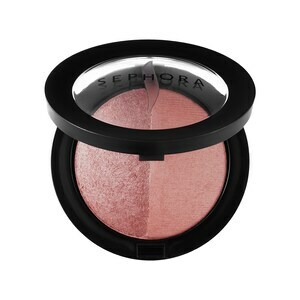 – Sephora Collection MicroSmooth Baked Blush Duo – I love this blush. Its really mild and comes out so great. I use this in Tea Rose Tickle. This in combination with my bronzer makes me look like I have a sun-kissed look when applied properly. 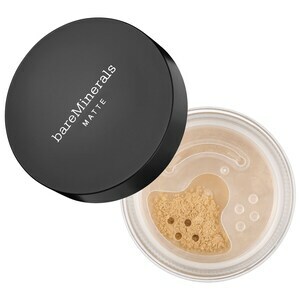 I use a blush brush for this and apply along my cheek bones. 7. 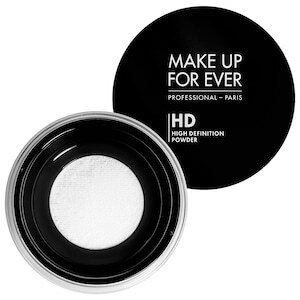 Setting powder to finish it off – Makeup Forever HD Microfinish Powder – I use any brush to dab this along my whole face to set everything. Particularly in the creases of my nose, under my lower lip/chin, and forehead where I get most oily. That’s it for my “face” before eyes. For eyes, I’m really simple for everyday. Otherwise I use eyeshadow. I don’t have a ton of eyeshadow and don’t use it unless for special occasions, so for the purpose of this post I will omit. 1. 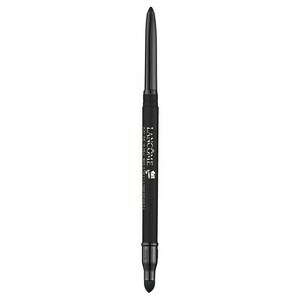 A good eyeliner – Lancome Le Stylo Waterproof Eyeliner – A lot of friends ask me how I get my eyeliner line so straight when applying everyday. I can do this literally in my sleep already (no joke!) and this pencil makes it so easy. It has a pencil side and a smudger side. I start by creating a fine line along the lash line and then use the smudger side to spread it across the eye to straighten out. It’s fool proof! I get this in Noir. 2. 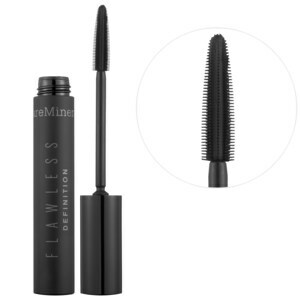 A mascara that lengthens and separates – bareMinerals Flawless Definition Mascara – I have really long eye lashes naturally but this mascara helps me really get in there and separate and lengthen without compromising volume. It’s also not waterproof so its easily removable with water/soap so it doesn’t damage lashes. I don’t know why so many women use waterproof mascara everyday unless you cry everyday! Again, you don’t have to spend a lot of money on these products. Skip the Burberry or Doir and go for this. Few side notes, I also sometimes use the smudger side of the eyeliner pencil to create a light line underneath my bottom lashes. I also use this eyebrow brush to shape my brows. I don’t typically wear anything but chapstick on my lips. Simple as that! This red lipstick by Hourglass. I got it as a sample and fell in love. It applies shiny and then matte-ifies to be perfect. This mask. I really like how my skin feels after using this. Its really mild and works wonders to make me glow. So that’s my routine. Maybe one of these days I will post a video of the whole process. What works for you guys? What are your favorite products?